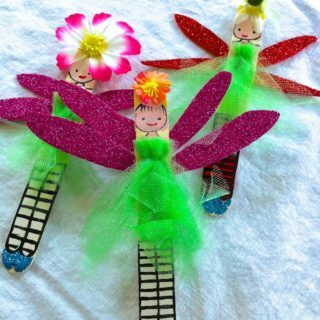 If you’re going to craft with your kids in the summer, would you prefer to keep the theme along things that you know they love? 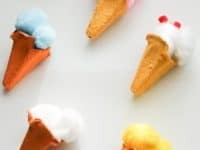 Even though it’s a small detail, we find that we can keep our kids’ attention even better than usual on the hottest days when we help them create something that makes them think of their favourite cool treats. 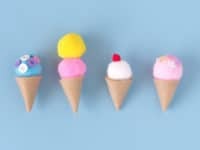 That’s how we found ourselves combing the Internet collecting ideas for ice cream themed crafts to try out this summer when we’re not on the beach and enjoying the sunshine. Just in case you think your kids might enjoy making ice cream themed DIY projects as much as ours do, here are 15 of the cutest and most interesting designs we’ve come across so far in our search! 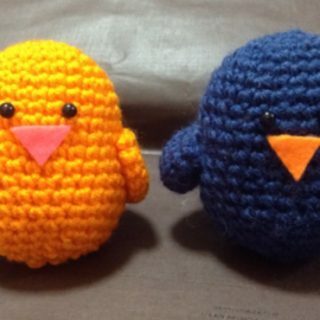 If you’re going to help your kids make something that will really keep them busy, would you prefer to put your time into something they can both help you craft and continue playing with once the project is all finished? 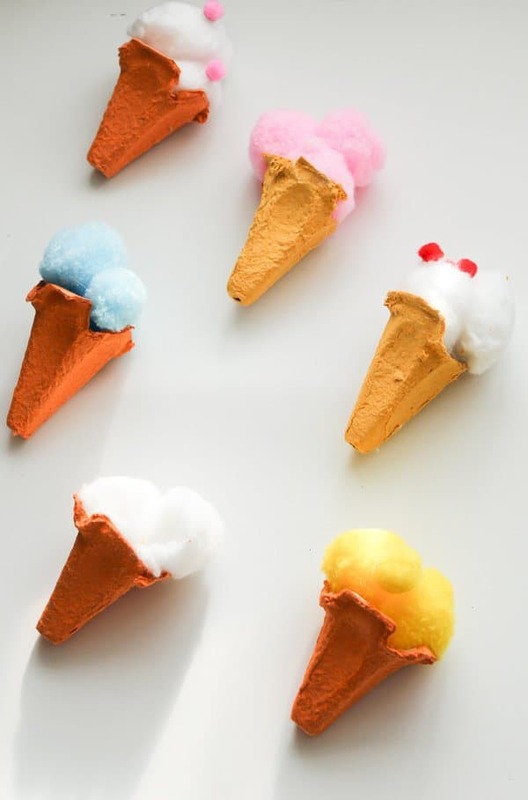 Then we’d definitely suggest taking a look at how Hello Wonderful made these fantastic play food ice cream cones from papier mache and plaster of Paris! Our kids have always loved toy foods and spent hours playing with them, so they got an extra huge kick out of helping us make a few new pieces to add to their collection from scratch. 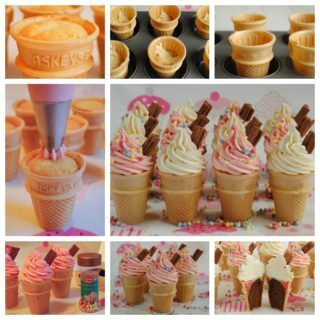 We were also very impressed indeed with how realistic this technique makes the ice cream look! 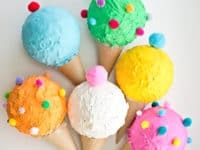 Are you quite interested in the idea of making an ice cream themed craft that looks very real indeed when it comes to texture but you’re just not sure your kids are ready for the challenge of working with messy techniques like the ones we showed you above? Then perhaps they’d get along better with a simpler puffy paint project instead! 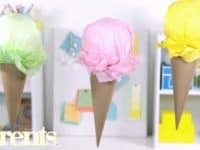 Crafty Morning shows you how to make cones from cardboard and markers, adding the scoops of ice cream with swirled paint that dries with some shape and texture. 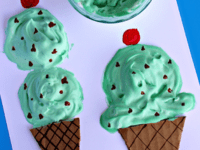 They made mint chocolate chip ice cream, but you could choose other colours to make all kinds of flavours in your cones! 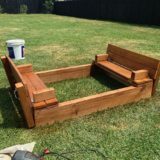 Have you actually been scrolling through our list hoping to find some crafting ideas that will help you show your kids new DIY techniques using different kinds of materials than they’re used to? 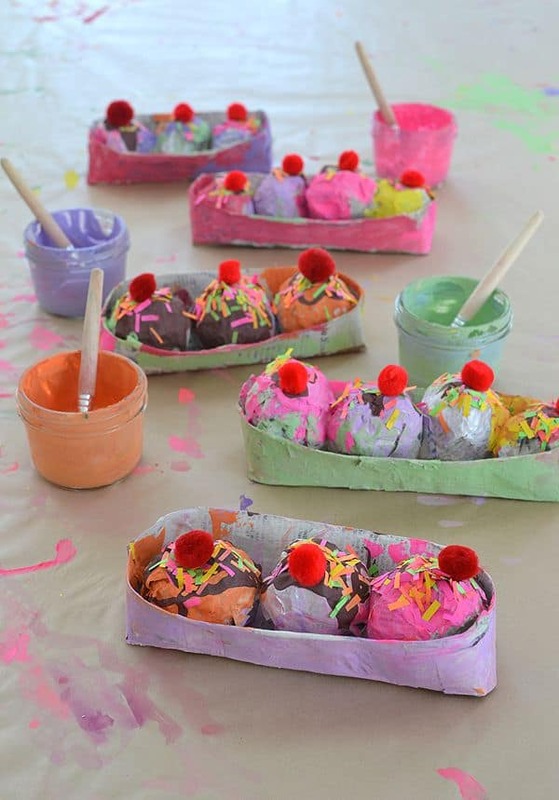 Then we’d absolutely suggest checking out how Art Bar made funny little cherry topped, triple scooped ice cream sundaes from drying play dough and duct tape! Paint the whole thing whatever colours you please then add pom poms and some brightly coloured sprinkles made from confetti. 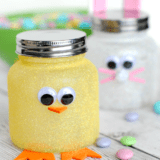 Speaking of play dough, have we hit the nail on the head with that idea when it comes to what kinds of crafts your kids like doing most? 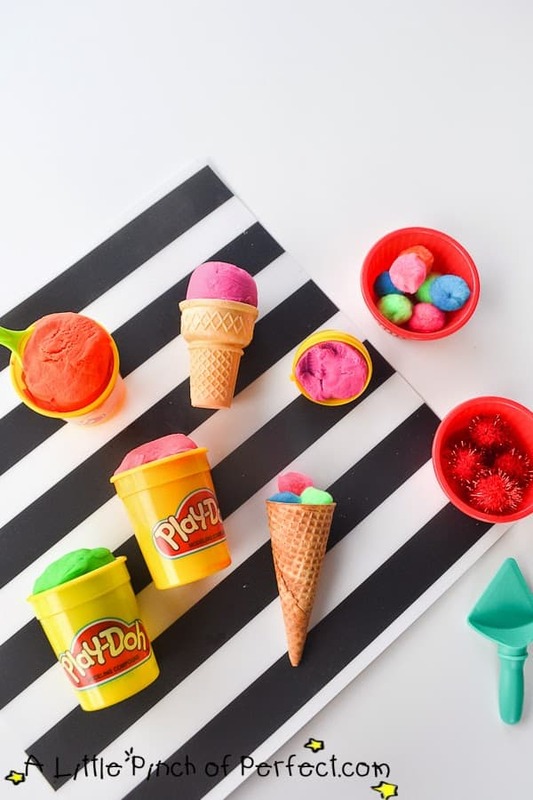 Then maybe sticking to simple play dough is actually the best idea for you if you’re looking for a quick, easy afternoon of DIY time! 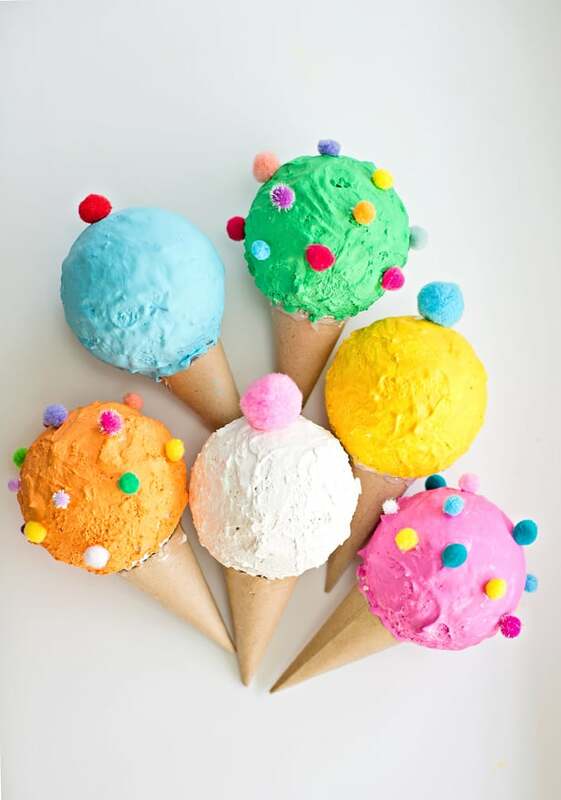 A Little Pinch of Perfect suggests letting your kids roll their dough into a ball and stack it into actual ice cream cones, topping the differently coloured “scoops” with pom poms to look like cherries and sprinkles. As long as the cones don’t break and get mushed into the play dough, we like that you can pack it all away and use it again another time. 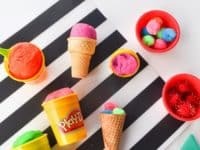 Are you very intent on sticking with this super fun ice cream theme that we’ve got going throughout our post, but you also know that sometimes your kids want to craft on a whim, giving you very little time to help them prep or gather supplies? 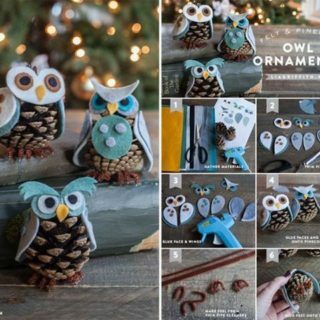 Then we always think it’s productive to have a simple paper based cut and paste project up your sleeve, just for a classic project that’s easy and fun to do. 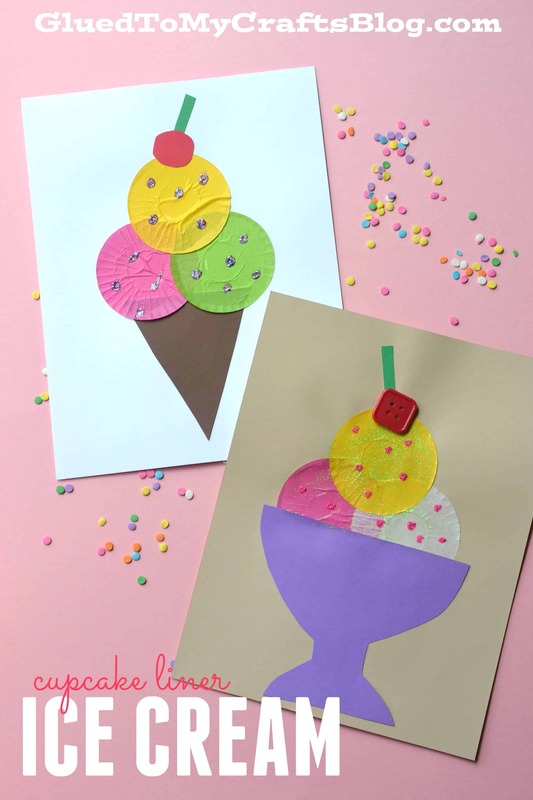 Check out how Kid Things curled their paper into 3D cones and slotted a circular “scoop” in so it stands up in the right direction. 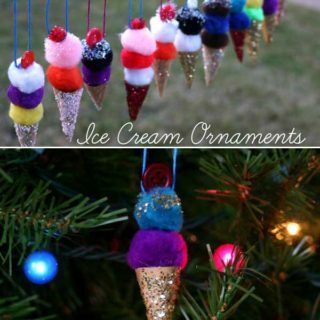 Decorate the scoops however you please with markers or felt tipped pens! 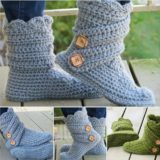 Have you actually been looking for simple ways to introduce your kids to the skills involved in working with softer crafting materials like fabric for a while now, with the hopes of teaching them how to hand stitch and sew soon? 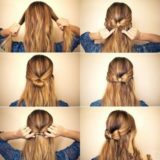 Then we think perhaps we’ve found just the tutorial for you! 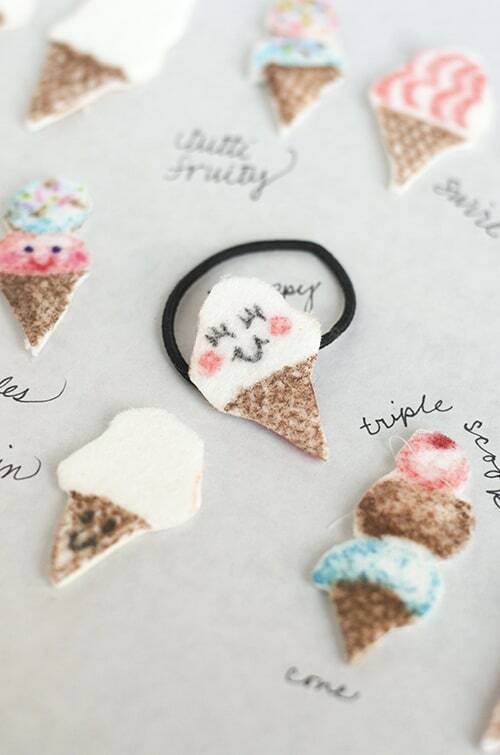 Paper and Pin guides you step by step through the process of twirling, rolling, stuffing, wrapping, and gluing pieces of felt into the right shape to make a series of adorable little ice cream cones that you can turn into all kinds of decorative pieces, like buntings, doll toys, or hanging ornaments! Are you very much intrigued by the idea of working with felt but you’ve actually always been more of a paint and hand drawing based artist than you have a skilled sewing enthusiast? Then we think you’ll really appreciate how Willowday is here to save the day! 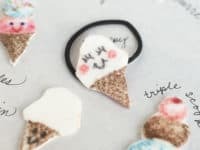 They suggest making adorable ice cream cone hair pieces by cutting the basic shape out in felt, adding cute details with paints or felt markers, and attaching your cones to some simple hair elastics. 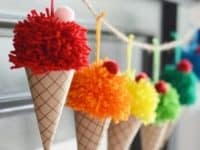 We helped our kids make a whole collection of these in all different colours and they’ve spent most of the summer with their hair tied in high, happy ice cream clad pigtails. 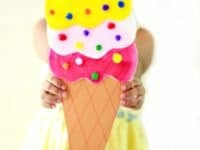 Now, whenever we read about a DIY project that claims to be “edible”, we get a little hesitant because we know that if we tell our kids they can eat something… they will gobble up the whole darn thing in two bites. 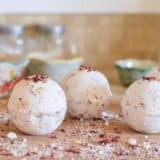 While many play dough recipes are, in fact, safe to consume, they shouldn’t necessarily be eaten like an afternoon snack. This particular recipe featured on The Life of Jennifer Dawn, however, really is completely safe to eat! We think that’s a great thing, too, because it’s so incredibly realistic looking when you mould it into ice cream scoops that we have to actively discourage our kids from taking big bites. Even so, we still help them make it so they can play ice cream shoppe whenever they please. 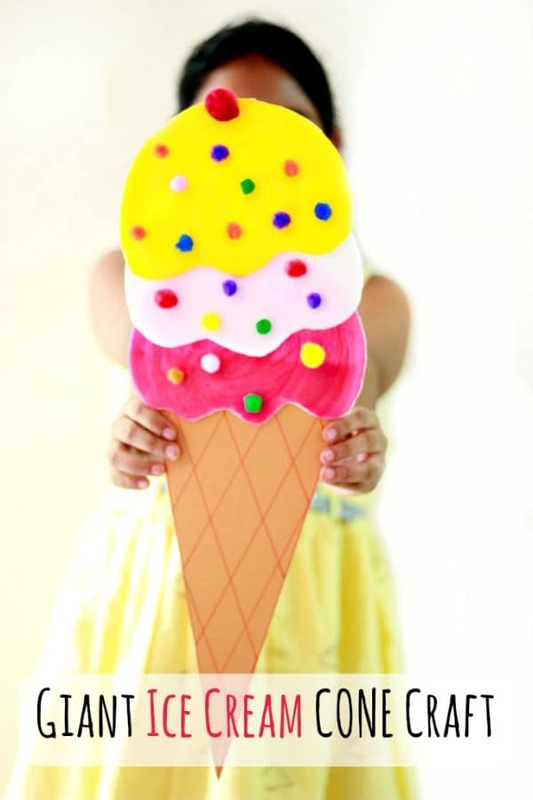 We just offer them real ice cream at the end of they promise us not to eat their play food when our backs are turned! 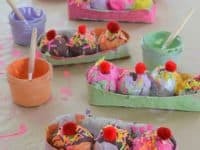 Are you still thinking about how much you love the idea of helping your kids create all kinds of ice cream crafts from different unconventional and upcycled materials, but you just haven’t seen the idea that quite holds your attention yet? 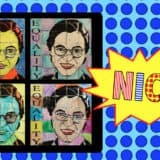 Then here’s another for your consideration, just to make sure you know what all your options are! 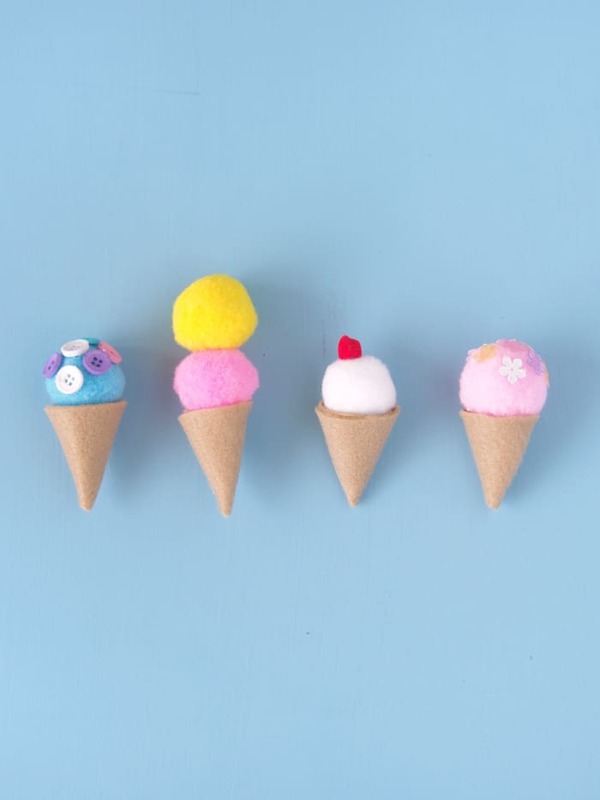 Take a look at In The Playroom to see how they created adorable little ice cream cones made from cut up pieces of egg carton and fluffy, colourful pom poms. Do your kids actually love upcycling crafts so much that you’ve started keeping a whole pack of paper plates around just for the purposes of making them into all kinds of fun, exciting things? 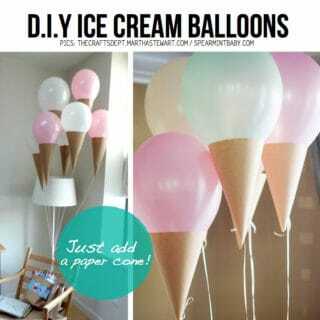 In that case, we think you’ll get a pretty big kick out of how Glued to My Crafts created these cute ice cream cones out of plates that have been folded in half, pieces of cardboard, and some tissue paper. Perhaps you’re quite intrigued indeed by the idea of crafting with disposable plates but you’ve taken a look in your cupboard and realized that the only kind you have are the foam ones and not the ones made of paper? 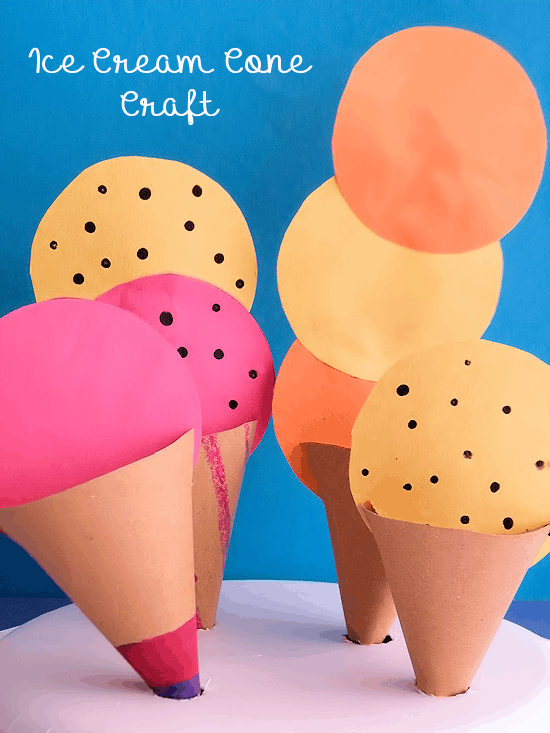 In that case, we think you’d have a better time making something like this giant foam plate and construction paper ice cream cone craft outlined step by step on Makes and Takes instead of what you’ve seen before! 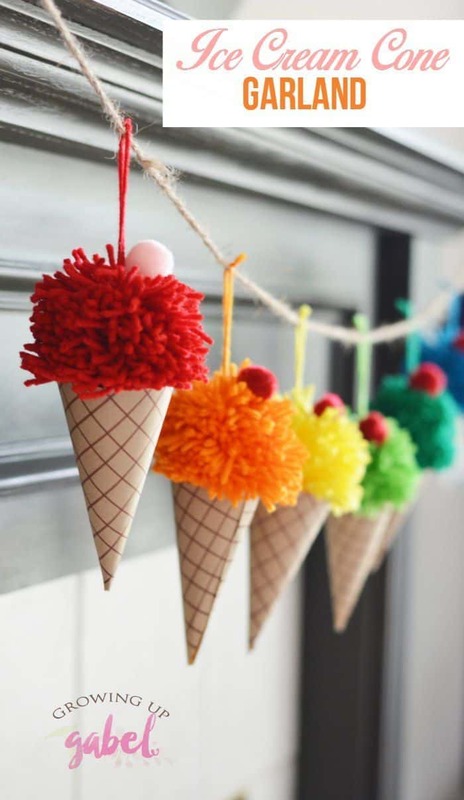 We love the way they cut a wavy bottom on their “scoops” to make them look layered, gluing crafting pom poms to the front like sprinkles. 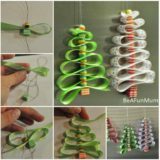 Have you checked your cupboards with the intention of making upcycled crafts from disposable kitchenwares with your kids today and discovered that you don’t actually have any left? Then we’d suggest reaching for that packet of cupcake liners instead! 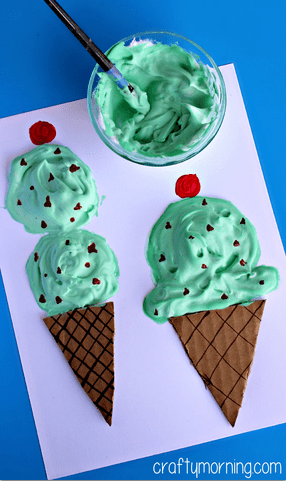 Glued to My Crafts shows you how to make a simple cut and paste craft where, rather than just being plain construction paper, your ice cream scoops are already pre-cut because they’re made from flattened out cupcake liners. 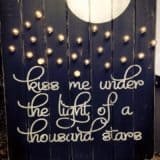 We love the way they embellished their pictures with glitter and buttons! 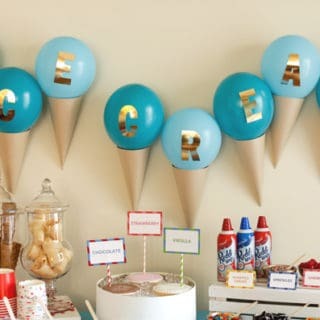 Did we really catch your attention when we started talking about how those little felt ice cream cones we outlined earlier could easily be made into party garlands, but you’re wondering whether you might like the idea better if the cones were much bigger and more attention grabbing? 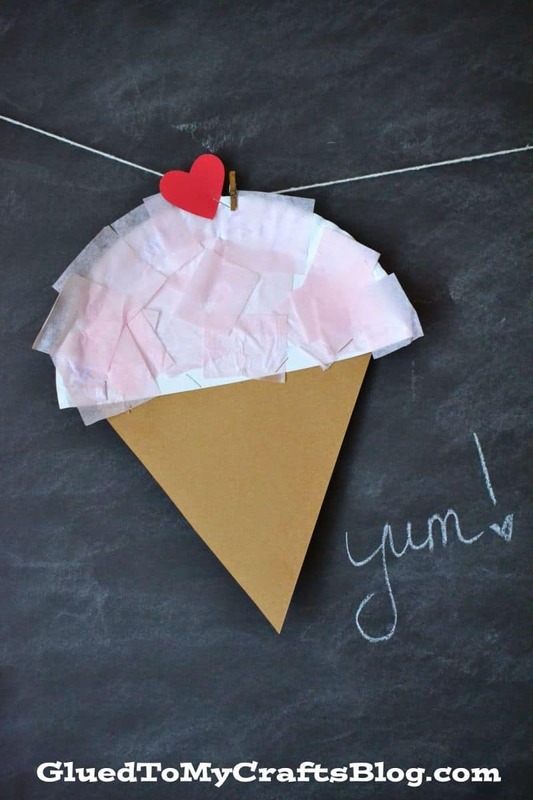 In that case, we think you simply must take a look at how Parents created a super fun bunting by stuffing tissue paper into a round and crinkled shape and mounting that on a paper cone! 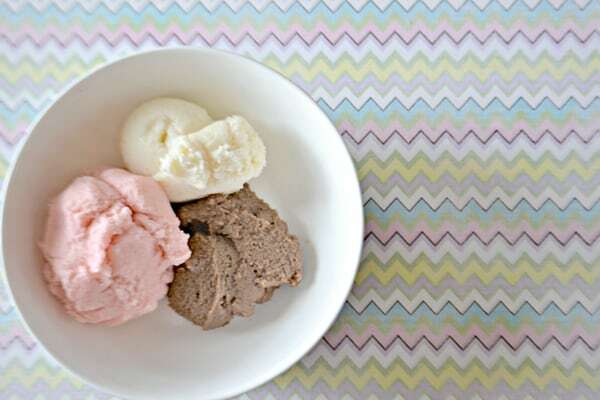 We love the bundled, 3D look of each scoop on top, as well as they way they made each one a different colour. 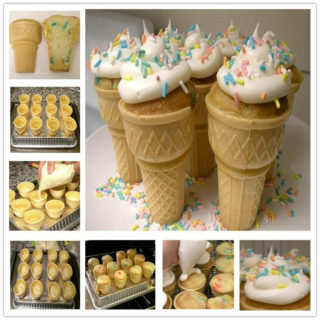 Did we really catch your attention with the tissue paper ice creams we just showed you above but you have a feeling your kids might actually prefer to make ice cream cones that have more than one scoop, just because that’s how they like their ice cream in real life? Well, it’s not a hard adjustment to make but we can fully understand wanting a little guidance even so. 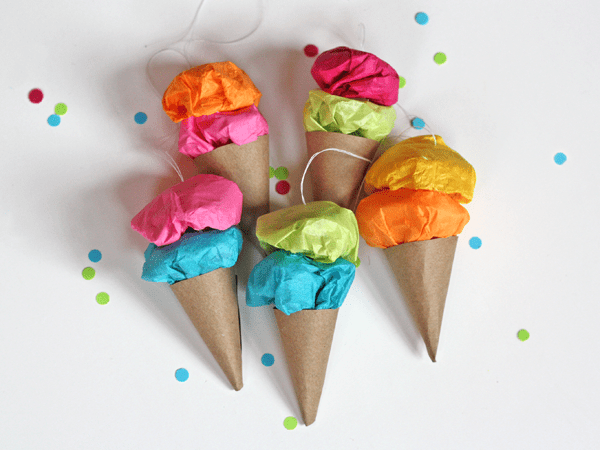 That’s why we were pleased to come across this cute paper ice cream cone ornament tutorial featured on Glued to My Crafts! 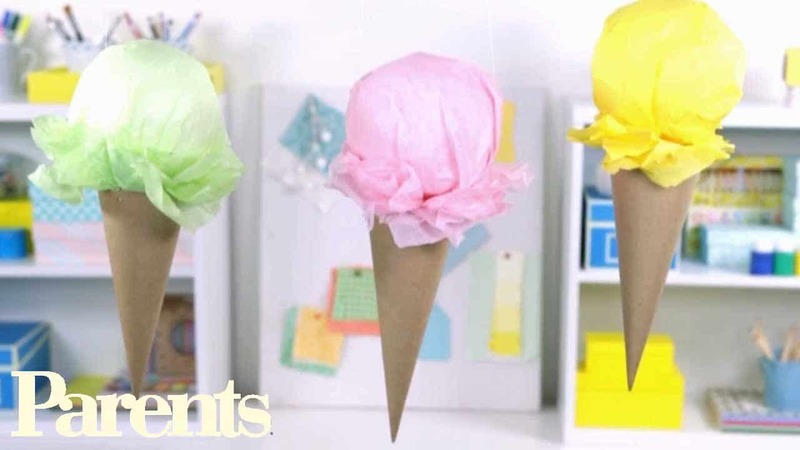 Okay, we know we’ve already given you several different tutorials to guide you through the process of making ice cream cone shaped buntings or garlands, but there are just so many different impressive ways to do it that we can’t resist including one more! Just in case you’d rather craft with yarn before just about anything else, here’s an awesome tutorial from Growing Up Gabel for making a string of adorable hanging ice cream cones from construction paper and DIY pom poms.